"I always take pity on people who love the movies. I can't help it. Do you like the movies, Hugo?" "My father always took me to the movies for my birthday," he answered. "What did you see?" asked Isabelle. Hugo looked at both of them. He thought about the times he had gone to the movies with Father and how much they had loved being together in the darkness of the cinema. Finally, Hugo answered Isabelle's question. "My last birthday we saw a movie with a man hanging from the arms of a giant clock." "Oh, that's a good one! It's called Safety last," said Isabelle, "starring Harold Lloyd." 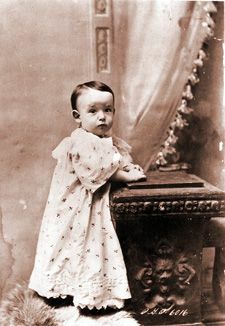 Harold Clayton Lloyd was born in Burchard, Nebraska, on April 20, 1893, the second son to James Darsie and Elizabeth Fraser Lloyd. 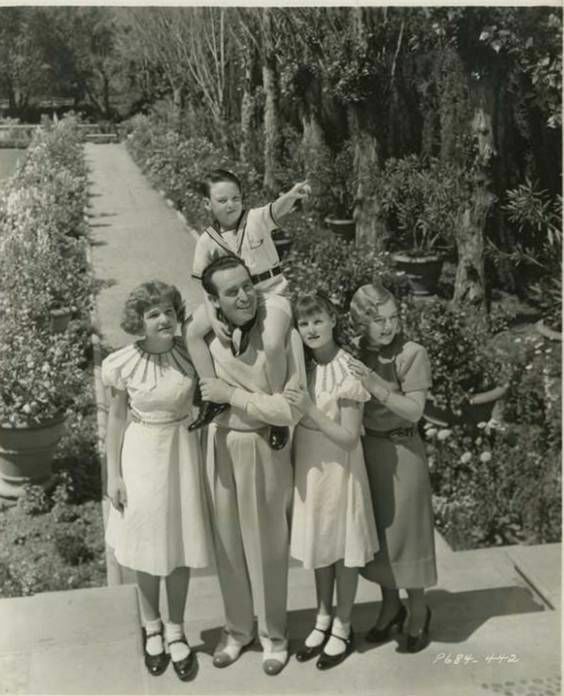 Elder brother, Gaylord, had a short-lived career as a silent film comedian, but found a permanent home as occasional assistant director and vice-president for the Harold Lloyd Corporation. Harold's mother died in 1941, his brother in 1943, and his father (who had a cameo role in Harold's Over the Fence in 1917), in 1947. As a youth, Harold's chief ambition was dramatic acting - in his adolescent theatricals, he always chose the role of the heavy, feeling such roles 'had more bite.' It was in 1913 that Harold Lloyd made his film debut, in Edison's The Old Monk's Tale. Up to that point, he had dreams of stage dramatics - now, with money short, extra roles paid the rent. Lloyd's first character was Willie Work, followed by the more popular Lonesome Luke. Seventy-one Luke comedies were released between 1915 and 1917. 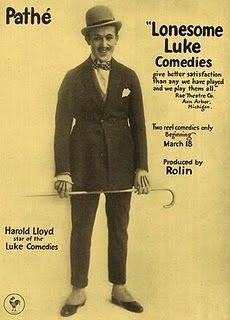 Lloyd's dissatisfaction with comedy-conformer Luke led him to create the Glasses Character in 1917, and this was the character that was to achieve for Lloyd world-wide fame and immense wealth. He found his ideal character traits over time - his is a true evolution in comedy, for he lacked the valuable vaudeville training of his chief contemporaries, Charles Chaplin, Roscoe ´Fatty´ Arbuckle and Buster Keaton. A tragic bomb blast - a thought-to-be papier-mache bomb blew up in his right hand on August 24, 1919 - almost closed a blossoming fame. Happily, with help from Roach and former glove salesman Samuel Goldwyn, Lloyd was able to hide his deformity within a prosthesis. Fans never knew of Lloyd's handicap, nor the fact that the man who was achieving his unique brand of comedy - athletic, enthusiastic, quick-paced - was achieving his goals with one and a half hands. Harold Lloyd made his first Lonesome Luke two-reeler in 1917, his first Glasses Character two-reeler in 1919, his first three-reeler and his first feature in 1921, eleven silent features from 1921-1928, seven sound features from 1929-1947, and two film compilations, in 1962 and 1966. He produced scores of films, including A Girl, a Guy and a Gob (1941) and My Favorite Spy (1942), as well as a series of silent shorts by Edward Everett Horton in 1927-28. Lloyd received an Honorary Academy Award in 1953, two George Eastman House Lifetime Achievement Awards in 1955 and 1957, and was elected Imperial Potentate of the Shriners in 1949. He was a founding member of the Academy of Motion Picture Arts and Sciences, in 1927. He has two stars on the Hollywood Walk of Fame. His was only the fourth ceremony preserving his handprints, footprints, autograph, and outline of his famed glasses (which were actually a pair of sunglasses with the lenses removed), at Grauman's Chinese Theatre, in 1927. Note that the index finger on his right hand made a lighter impression than his other fingers. Harold married his leading lady Mildred Davis in 1923 and Mildred gave up her career as an actress to raise a family; the couple had three children, a daughter Gloria, an adopted daughter Peggy, and a son Harold Lloyd Jr.
Harold built a fabulous home for Mildred and the children called Greenacres, which was one of the showplace homes of early Hollywood. Called "the most impressive movie star's estate ever created," Greenacres occupied 16 acres above Benedict Canyon. 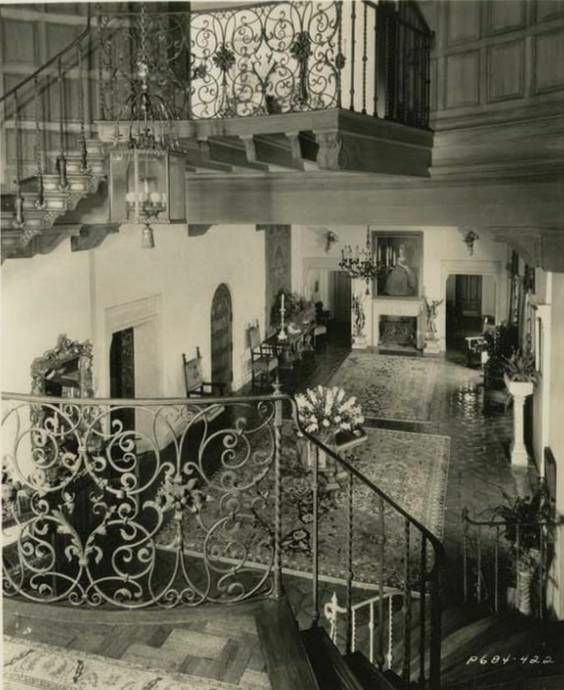 Completed in 1927, the original estate included a 42-room mansion, outbuildings, golf course, canoe lake, and 12 themed gardens. After Lloyd's death in 1971, it was sold and subdivided. The mansion and remaining grounds were first bought and restored in 1979, and again in 1986. Harold Lloyd's personal, family and professional life was far more stable than his main competitors', Charles Chaplin and Buster Keaton. He had left Hal Roach in 1923 on good terms and had formed his own company called The Harold Lloyd Corporation; he was one of the few stars who actually owned his most successful film properties. In 1928 Harold published his own autobiography entitled “An American Comedy." When the sound era arrived Harold continued to make interesting comedies such as "Movie Crazy" (1932) and "The Milky Way" (1936), but his film career was winding down as he aged and as the public's tastes in films changed. Harold continued to be involved with the industry off screen as a producer, writer and director, and he enjoyed experimenting with different hobbies and businesses, including 3-D color photography. He briefly reappeared as an actor in one last film made in 1947 and retitled "Mad Wednesday" (released 1950). In 1962 Harold made a documentary film called "Harold Lloyd's World of Comedy" which created new interest in his work. He enjoyed touring on college campuses during the 1960's, showing his 1920's silent classics to a new generation of film fans. 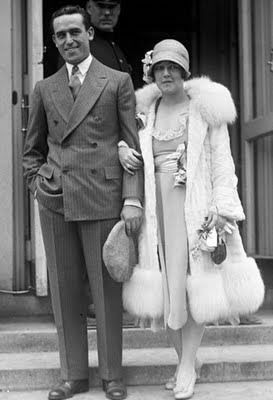 In 1969 his beloved wife Mildred died from a heart attack, and Harold died two years later from prostate cancer, on March 8th, 1971 in Beverly Hills, California at the age of 77. Only three months later his son Harold Lloyd Jr., who had been an actor himself, died from the effects of a massive stroke. Harold Lloyd's legend lives on, and will continue to grow, as new generations are exposed to his genius. 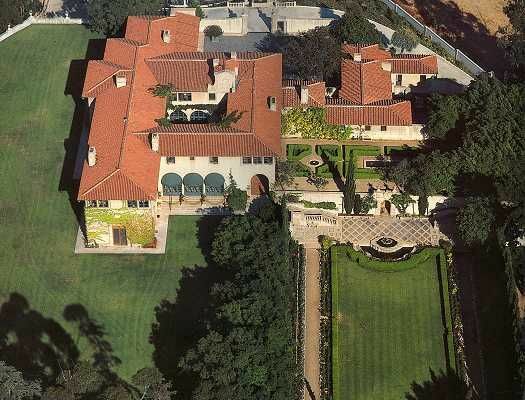 In 1984, his mansion at Greenacres was named to the National Registry of Historic Places. 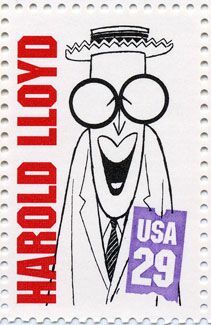 In 1994, Lloyd was one of ten silent film stars to be honored on 29c United States Postage Stamps. Harold Lloyd continues to be recognized as one of the three supreme geniuses of silent film comedy. His appeal in his heyday was different than any of his contemporaries, for his character, the optimistic plucker who smiled and fought his way through all adversity, mirrored his audiences in outward appearance and in inward determination, in a way that no other comedian ever did. The fame and adulation he enjoyed in his heyday deserves to be reassessed and introduced to current and future generations. The Harold Lloyd Trust will continue to make Lloyd's marvelous body of work more accessible for the next and coming generations to enjoy. His best known pose - dangling from the hands of a clock, stories in the air - is just one of a host of vivid images that the Lloyd audience member comes away with. It has been said that, once you see a Lloyd film, you want to see another. "History remembers the stars of slapstick including Charlie Chaplin, "Fatty" Arbuckle, Mabel Normand, Buster Keaton and Harold Lloyd. Harvey Parry, a medal winner in the Pan Am Games for boxing and diving, doubled Harold Lloyd. 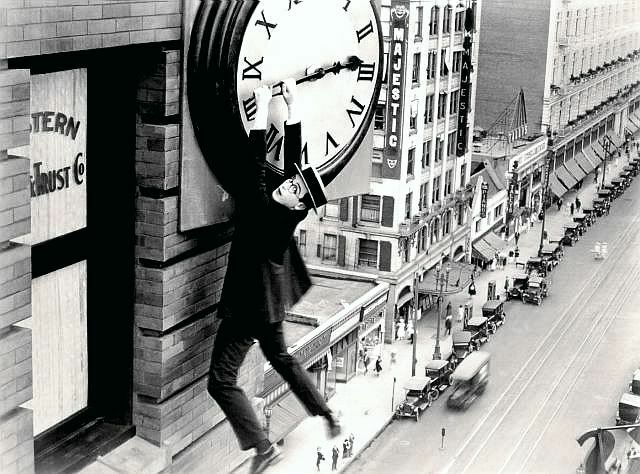 In fact, it is stuntman Parry who hangs from the clock in the long shot of that most famous scene from Safety Last. But don't expect to find his name on the credits: Parry had an agreement with the studios never to divulge this fact and he kept his word throughout Lloyd's lifetime." 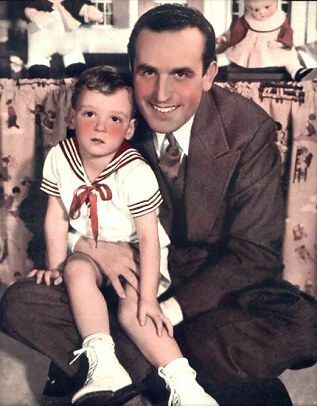 I enjoyed reading about Harold Lloyd not only for his imagination, talent and all he added to the film industry - but his success as a family man too. It reminds me of someone we all admire and both men demonstrate that actors can achieve success and still be honorable people. 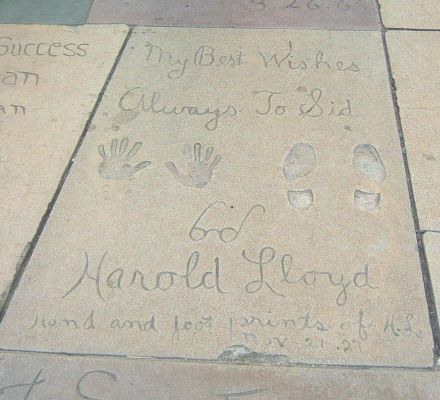 ladylinn wrote: I enjoyed reading about Harold Lloyd not only for his imagination, talent and all he added to the film industry - but his success as a family man too. It reminds me of someone we all admire and both men demonstrate that actors can achieve success and still be honorable people. We have an accord, ladylinn. Boy is that a case of being in the right place at the right time, just at the very start of motion pictures. Fortunate man, and good he was able to separate himself enough from the whirlwind of Hollywood and fame to have a genuinely rich life. Thanks. I'd never seen a picture of the older Lloyd nor heard his voice. Especially enjoyed the two tidbits: his hand being injured and the hidden story of the man who actually hung off that clock. 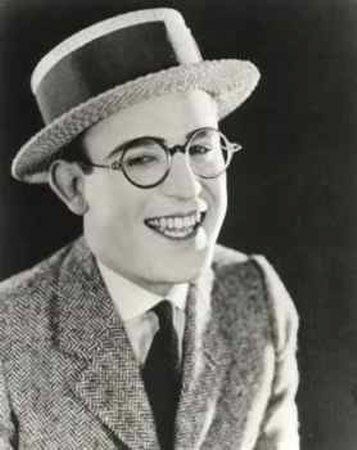 Harold Lloyd was a bit before my time. I do recognize his name and enjoyed learning about him. I have seen the famous clock photo. Its nice to hear that he made a success of his film career. I have always loved this man's films. I find it especially interesting to explore how these shots were filmed. I saw a program that showed a different view of the hanging off the clock shot. It looks as if he was dangling off a steep dropoff to the street below. In actual fact, in the longer shot view, he was a couple of feet off of the roof of the building just under the clock. I remember laughing my head off the first time I saw the "real" shot of that scene. I read that he created elaborate scaffoldings to carry off his stunts. Well done says I!